I love to cook ribs low and slow, then grill them with BBQ sauce to make them crisp and flavourful. But slow roasting the ribs in the oven takes hours. You can get the same tender results in the Instant Pot in minutes! I normally make at least two racks of ribs in the oven, since it takes so much time and effort, but with this method, I can justify making just one rack for a weeknight dinner. I never thought I'd have homemade ribs on a weeknight! I use a homemade spice rub when I make ribs, but you can season them any way you like. Montreal Chicken seasoning is great for ribs. 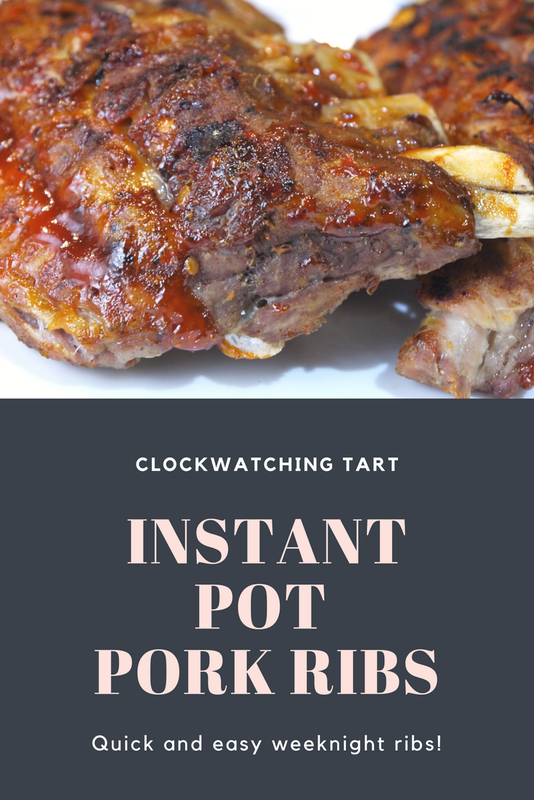 In the Instant Pot you need to use the rack to cook ribs. You also need some liquid for pressure cooking. I used chicken stock this time, but apple juice, cider or beer would be great! For tender ribs, cook on Manual for 21 minutes. It will take about 40 minutes when you include time to build up and release the pressure. Still reasonable for a weeknight dinner! You can spread the ribs with your favourite BBQ sauce and serve when they come out of the Instant Pot, but I like to crisp them up on the grill. Mix all spices together and store in a sealed container.